Hi friend! I hope you’ve had a splendid week. 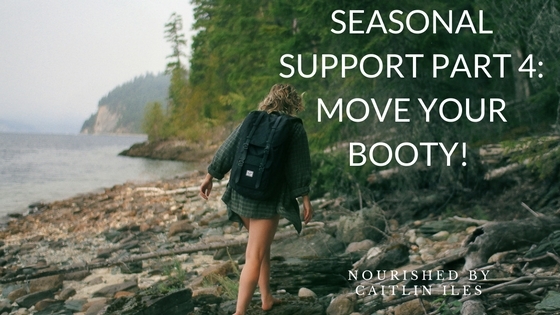 Today I’m going to wrap up my seasonal support series with part 4 (Check out part 1, part 2, part 3, and the bonus), which highlights the importance of moving your booty to support immune function. As with all aspects of your health, exercise requires an individualized approach to finding the proper type, frequency, and duration to support, rather than suppress immune function. What that looks like for each individual will be different, but for your average person a regiment that includes a couple days of intense interval training, a couple functional strength training sessions, and lots of steady movement (such as walking!) is a great place to start. These recommendations are not for those training for specific sports/events, but simple guidelines for optimal health. Now I know for lots of people that kind of regiment sounds super boring, so check out this article I wrote on Finding your Fit to find the activity that best inspires you. What you’re looking to avoid are chronic med-high intensity activities, several times a week with few or no rest days in between as this type of exercise has been linked with decreased immunity in the long term. This type and frequency of exercise has even been linked to increased respiratory infections, and who wants to suffer through winter fighting off the icky coughs and phlegminess associated with that? What happens when you push your body to her limits 5-7 days a week is an increase in cortisol, which, as you know, suppresses immune function long term. So an example from my life is that when I push myself to do 5 or 6 super sweaty and intense vinyasa classes a week and no restorative practices, I tend to burn out and get sick. However, 2-3 of those practices, combined with 1 or 2 restorative classes, and lots of walking puts me at my peak fitness and immune function. Studies have shown that acute exercise has been linked with an enhancement of T-cell activity meaning you’ll be more primed and ready to fight off illness, infection, and disease. You also want to set the foundation for lifelong health, by starting to move a little bit now so that you maintain mobility through old age. This study shows that women who maintained their fitness levels into their 60s through to their 80s had better markers of immune function than those women who started exercising at that age. So you might as well get to steppin’ while you’re young and agile! So what’s the take away from all of this? Basically, you need to find the right dose of exercise that works for your body and your life. This dose will change over time based on your fitness levels, the seasons, and your other stressors, but the most important thing is to get your booty moving a little bit every day to reap the rewards and boost our immune function. Start with a couple of walks a week and build from there! Well that’s all for today friend. If you’re looking for some other ways to boost your immune function make sure you download my FREE Fantastic Fermentables E-Book by clicking here. It’s packed with recipes to help boost immunity! I hope you have a wonderfully whimsical weekend!